This book explores the central questions and themes lying at the heart of a vibrant area of philosophical inquiry. Aligning core issues in psychiatry with traditional philosophical areas, it presents a focused overview of the historical and contemporary problems dominating the philosophy of psychiatry. Beginning with an introduction to philosophy of psychiatry, the book addresses what psychiatry is and distinguishes it from other areas of medical practice, other health care professions and psychology. With each section of the companion corresponding to a philosophical subject, contributors systematically cover relevant topics in philosophy of mind, philosophy of science, ethics, social and political philosophy, metaphysics, epistemology, phenomenology, and philosophy of medicine. Looking ahead to new research directions, chapters address recent issues including the metaphysics of mental disorders, gender and race in psychiatry and psychiatric ethics. 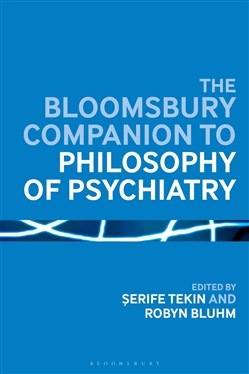 Featuring discussion questions, suggestions for further reading and an annotated bibliography, The Bloomsbury Companion to Philosophy of Psychiatry is an accessible survey of the debates and developments in the field suitable for undergraduates in philosophy and professional philosophers new to philosophy of psychiatry. Acquista The Bloomsbury Companion to Philosophy of Psychiatry in Epub: dopo aver letto l’ebook The Bloomsbury Companion to Philosophy of Psychiatry di ti invitiamo a lasciarci una Recensione qui sotto: sarà utile agli utenti che non abbiano ancora letto questo libro e che vogliano avere delle opinioni altrui. L’opinione su di un libro è molto soggettiva e per questo leggere eventuali recensioni negative non ci dovrà frenare dall’acquisto, anzi dovrà spingerci ad acquistare il libro in fretta per poter dire la nostra ed eventualmente smentire quanto commentato da altri, contribuendo ad arricchire più possibile i commenti e dare sempre più spunti di confronto al pubblico online.